When Bolivia’s President Evo Morales last December suffered his first major setback since coming into power in 2006, provoking the largest popular revolts in the past 10 years, one of the president’s former friends celebrated the government’s defeat. Oscar Olivara speaks at the 2011 School of Authentic Journalism. DR 2011 Noah Friedman-Rudovsky. 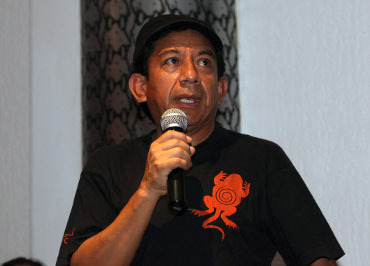 But for Oscar Olivera – a social movement leader who helped make it possible for Morales to be elected in the first place – victory was bittersweet. Olivera had actively contributed to the countrywide protests in 2000 that forced the Bolivian government to back down almost immediately on an unpopular measure seeking to privatize water rights in Cochabamba, Bolivia’s third largest city. Those protests were a test of unity for Bolivia’s social movements, and leaders such as Morales and Olivera stood side-by-side. The decision to privatize the public water system was partly the result of World Bank pressures. Accepted knowledge at the World Bank, which at the time was a main lender to Bolivia, was that private corporations could run services more efficiently than local authorities, which were often corrupt and lacked the necessary skills. In Cochabamba, Aguas de Tunari, a subsidiary of several multinational corporations, including the US company Bechtel, took over water services. Morales joined the campaign with his union of cocaleros, or coca-leaf farmers, but the main leader behind that mobilization was Olivera, who, among other things, was forced into hiding for a time due to the success of the campaign—which became known as the Water Revolt. Ten years on, the Morales government’s recent effort to suspend gas subsidies, although ultimately unsuccessful, brought a rupture in Olivera’s relations with the current administration. “Up until Dec. 26, 2010, I considered Evo my brother, my compañero,” Olivera said during an interview at the School of Authentic Journalism, an intensive ten-day workshop held near Mexico City, with a focus on journalism and the coverage of nonviolent civil-resistance movements. Olivera thinks that the measure was taken without previous consultation with those who would be affected, mainly the most vulnerable sectors of society, a measure he believes that the government owes to his people. “This government has abandoned the process of change led by the people who fought for many years,” said Olivera. The announcement was made right after Christmas, while Morales was visiting Bolivia’s major ally Venezuela. The onus fell on Bolivian Vice President Álvaro García Linera, also a former friend of Olivera’s, to announce that the government was going to suspend gas subsidies. However, as a result of the measure taken, gasoline prices went up by as much as 73 percent, pushing prices for food and transport through the roof. That’s when Bolivians took to the streets again – in the biggest protests in years. Bus drivers went on strike across the country, and coca leaf growers—part of Morales’ support base—blocked one of the country’s main roads, which joins Cochabamba to the wealthy city of Santa Cruz in the east. Some protests turned violent, but most were spontaneous non-violent marches. On December 31, five days later, the Morales government backed down. But the damage had already been done. Not only had the president’s popularity gone down, but there was a rupture with social movements that had previously backed the president – such as the one led by Olivera. But according to the government, backing down was something to be proud of, because it meant they were listening to the demands of the people. “This episode confirms once again that we are a government that takes decisions by obeying the people,” said Vice President García Linera. The feud between Olivera and his former compañeros (or comrades, as they are sometimes called) shines a light on present conditions in Bolivia: the dilemma of a government elected on a radical agenda that now faces difficulties in bringing about actual change. Olivara during a plenary session at the school. DR 2011 Noah Friedman-Rudovsky. Morales and Olivera were both trade union leaders in the mid-1980s when they first met and took part in a march in Cochabamba. Two decades on, Olivera and Morales stand in sharp contrast in terms of their leadership history and style. “Our first encounter was not friendly. It was a confrontation. We had similar arguments for the following 20 years,” says Olivera, who views his former colleague as having authoritarian tendencies. Like him, many have criticized Morales for what they call arrogance and a top-down approach. Olivera comes across as a humble people’s man. His face does not give away his 56 years of hard struggle; and even after being responsible for one of the most successful movements in Bolivia, he still sees himself as a trade union leader and a spokesperson – not a politician. He is a very attentive listener whose stare is intensely focused but often broken up by a mischievous laugh at his own jokes. He proudly talks about his nickname, El Chato (“the small one”), which dates back to his times as a factory worker. “Oscar is the listener-in-chief of Latin America’s social movements,” says Al Giordano, director of the Narco News Bulletin, an independent news organization, and founder of the School for Authentic Journalism. Giordano is a long-time reporter on social movements in the region and has known both Morales and Olivera for ten years. The mobilization against water privatization in Cochabamba in 2000 represented a turning point in Bolivia’s history and prepared the terrain for Morales to step forward and eventually win the presidency. In its aftermath, the two leaders parted ways. “Evo decided to become president and I decided to stay behind with the people,” says Olivera. Olivera backed Morales’ bid for high office, because he believed that the government could bring about change. His name was unofficially put forward to become Minister for Water, but in the end the position was never offered to him. Olivera says in retrospect he was skeptical about Morales’ chances of effecting broad-based reforms in Bolivia as president. It is a huge challenge: Bolivia has a population of 10 million inhabitants and is the poorest country in South America. According to the most recent figures from Bolivia’s National Institute of Statistics, which date back to 2007, 60 percent of the population live below poverty line. However, Olivera was hopeful that as president Morales could achieve some incremental change. But after five years, the results are not visible, Olivera says, and the recent gas-subsidy rollback effort demonstrates that the government is out of step with the people when it comes to economic reforms. Land reform (which gave land titles to campesino communities) and social programs that include subsidies for lower-income families are among the successful policies adopted by the Morales government during the past five years. But there are many contradictions, and the country’s economic situation is still unstable. Olivera believes that the government has not done enough to restructure the economy, especially when it comes to redistributing wealth and power to the impoverished indigenous highlands. For example, the government is considering implementing a law to protect the rights of the Pacha Mama, or mother earth, which environmentalists say contradict the country’s continuing reliance on the mining of lithium and other minerals, as well as gas extraction in bio-sensitive areas. But the government says that structural racism, among other factors, are slowing down its attempts at reform. For example, the government has faced protests by the wealthy elites in the gas-rich eastern provinces who oppose economic change. In 2008, there were bloody protests and road blockades in eastern Bolivia following an attempt by the government to funnel gas revenues into a state pension fund. While Olivera recognizes the serious problems faced by the government, he still believes that the Morales administration needs to be challenged—as do all governments. For him, protests like the ones in December 2010 have shown that the people’s movement can still succeed, and that no government can afford to ignore the power of the people on the ground. “The people are ultimately those who are in charge, and the government must know that,” Olivera said. RIGHT 2 DREAM TOO RALLY AT CITY HALL – Feb 1st! Join us at the rally Wednesday February 1. Tell the City of Portland to waive the fines imposed on Right to Dream Too and support our work providing refuge and a safe space to rest or sleep undisturbed for Portland's unhoused community who cannot access affordable housing or shelter. A conversation at PCASC on 7/25/11 with Laura Carlsen.